Car was previously painted Red (original colour?). Offered for sale by "Shelton Ferrari" of Ft. Lauderdale, Florida in August 1984 (more than likely consigned to the dealership by the original owner, but this fact is unconfirmed). Purchased by Mr. G. B. of Totowa, New Jersey in June 1985 from "Shelton Ferrari". The owner then moved to Arizona. In October, 1985, the car was damaged in an accident, with both rear fenders and the front left fender affected. Car was repaired. Sometime in either 1989, or 1990, the car was repainted to it's current colour of Metallic Blue. Car was then sold to Mr. G. D. of Alabama in either 1992, or 1993. In 2002, Dr. J. K. of Great Neck, New York, purchased the car. In early 2006, car was purchased by Dr. W. D. of Atlanta, Georgia, but due to illness, offered the car up for sale in December, 2006, to "Buxton Motorsports" of Evansville, Indiana. Offered for sale by: "Cardiff Classics Inc." of Encinitas, California in June 2007. The car was also offered up for sale on ebay by themselves during that time. Current owner - Mr. K. O. 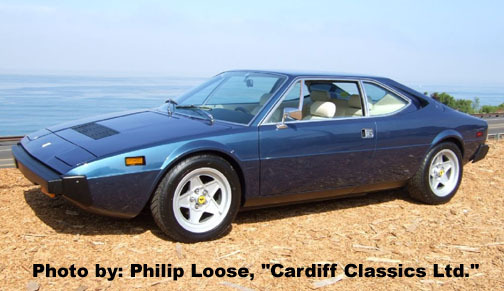 - purchased the car from "Cardiff Classics Inc." in July 2007.